Just saw The Book Thief . I give it five stars. Don’t expect car chases or GCI graphics. Expect a simple story well told. Ten-year-old Liesel tries to make sense of the world in Nazi Germany. She sees her young brother die and her mother, a communist, surrenders Liesel to the state. Her new foster father Hans charms the reclusive Liesel and teaches the illiterate girl to read. The midnight arrival of a young Jewish man then changes her world forever. The brave humanity of Liesel’s family stands starkly against the Nazi’s inhumanity. I wept for the last ten minutes, although it doesn’t take much in a movie or book to get me crying. Death narrates and proves himself more human than many of those whose souls he takes. 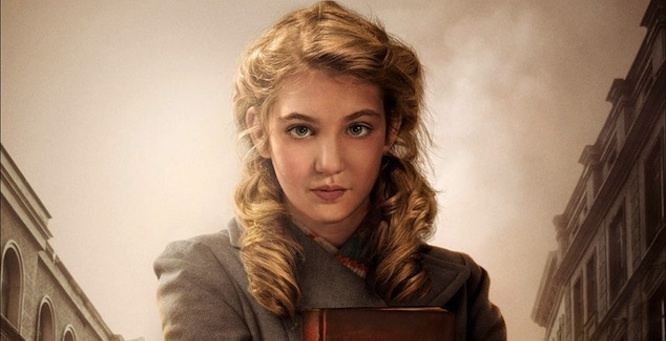 Sophie Nélisse plays Liesel to perfection. I nominate her for an Oscar. Geoffrey Rush does a great job as Hans. I saw a preview of The Book Thief over a month ago, but decided to first read the book. I found the first third of the book rather slow going, but ultimately I think the book better captures the essence of Liesel’s bewilderment and pain. Also, it better addressed the insidiousness of the Nazi disease. So, see the movie and read the book.